Michael Adrian Paul Joyce (born 1 June 1963) is an English drummer. He is best known as the drummer for The Smiths, an English rock band formed in Manchester in 1982. The band consisted of vocalist Morrissey, guitarist Johnny Marr, bassist Andy Rourke and Joyce. Joyce was born in Manchester to Irish Catholic parents, and attended St Gregory's Grammar School in the city. While The Smiths provided Joyce with his first taste of success, he had previously drummed for Manchester band The Hoax and Irish punk rock group Victim. Joyce was a member of The Smiths throughout the band's existence (1982–87). Immediately after the break-up of the band, Joyce and Smiths bassist Andy Rourke played with Sinéad O'Connor. They, along with Craig Gannon, also provided the rhythm section for two singles by Smiths' singer Morrissey – "Interesting Drug" and "The Last of the Famous International Playboys" and their B-sides. Work with Suede, Buzzcocks, Public Image Limited, Julian Cope, P. P. Arnold and Pete Wylie followed throughout the 1990s. Joyce, Rourke, and Gannon reunited to work on a project with fellow Manchester musician Aziz Ibrahim (formerly of The Stone Roses and Simply Red), ex-Oasis guitarist Bonehead (as Moondog One), and Vinny Peculiar. In 1996, Joyce sued former Smiths' colleagues Johnny Marr and Morrissey for an equal share of performance and recording royalties. Joyce won the case and was awarded damages of around one million pounds from Morrissey and Marr. According to Morrissey, who unsuccessfully appealed Joyce's claims, Joyce first sued Morrissey and Marr in 1989 for 25% of The Smiths' recording royalties. In 1996, Joyce won the case "on the basis of the 1890 Partnership Act". The next year (1997), according to Morrissey, "Joyce was paid 215,000 pounds from me, and 215,000 pounds from Johnny Marr. In 2001, as a final payment of back royalties, Johnny Marr paid Joyce 260 thousand pounds, plus 'costs'. At this time I [Morrissey] was in the US and was not served with court proceedings, so Joyce obtained a Default Judgment. He then put forward a claim from me for 688,000 pounds—well above and beyond the amount Johnny Marr was ordered to pay. In my absence, the figure was not contested. Since 2001, and because of the Default Judgment against me, Joyce has taken out Third Party Orders against the following societies: my personal bank account in England, Smiths royalties from Warner Music, my personal PRS royalties, my personal PPL royalties, and he has attempted to seize UK concert fees from venue to venue. This money, to date, totals 700,000 pounds. This figure is in addition to the figures mentioned above." Morrissey went on to claim that "[the] Joyce action is continuous. Because of his Default Judgment he continues to take my royalties, and the royalties of others mentioned above, from Warner Music—consequently I have not received record royalties since 2001." In July 2007, Joyce, along with former bandmate Andy Rourke released Inside The Smiths, a DVD which chronicled their experiences of being in the band. In October 2007, Joyce toured the UK playing drums for Vinny Peculiar with Bonehead on bass guitar, and in 2008 ran a successful night at The Brickhouse in Manchester called "Alternative Therapy". In parallel to his music career, he works as a DJ and broadcaster, including occasional appearances on BBC 6 Music. Joyce has hosted shows on East Village Radio, an internet station. Since October 2017, Joyce has hosted a weekly radio show on Manchester radio station XS Manchester. In October 2018 Mike Joyce' s radio show on XS Manchester was nominated in the 'Best Specialist Music Show' category at the ARIAS 2018 radio awards. Joyce married Christina Riley in 1994. The couple have three children. Joyce is a Manchester City fan  and is sometimes interviewed at City Square before important home matches. ^ Erlewine, Stephen Thomas. "Biography: The Smiths". AllMusic. Retrieved 2 June 2010. 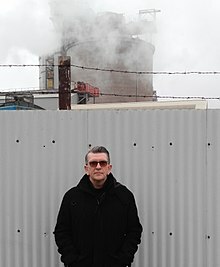 ^ "Mike Joyce | Biography & History". AllMusic. 1 June 1963. Retrieved 12 January 2016. ^ "Mike Joyce: A Vinny Peculiar Practice". Manchester Evening News. 29 August 2007. Retrieved 4 August 2018. ^ a b "Morrissey's final appeal to overturn 1996 Mike Joyce verdict dismissed". Morrissey-solo.com. Retrieved 13 November 2012. ^ True to You: a Morrissey zine, True-to-you.net; accessed 11 January 2016. ^ Mike Joyce details, Bbc.co.uk; accessed 11 January 2016. ^ "Mike Joyce Joins XS Manchester From October". XS Manchester. Retrieved 29 March 2018. ^ "BBC dominates shortlist for ARIAS 2018 radio awards". RadioToday. 17 September 2018. Retrieved 4 December 2018. ^ Binns, Simon (11 October 2016). "Is Mike Joyce Manchester's most romantic man?". Manchester Evening News. Retrieved 4 August 2018. ^ "He Bangs The Drums: Mike Joyce On Manchester City And Pellegrini - The Daisy Cutter". Thedaisycutter.co.uk. 28 April 2015. Retrieved 4 August 2018. ^ "City Square Live on Twitter". Twitter. Retrieved 4 August 2018. ^ "Manchester City on Twitter". Twitter. Retrieved 4 August 2018. "I Started Something I Couldn't Finish"
This page was last edited on 6 February 2019, at 18:45 (UTC).